A well preserved mammoth carcass pulled from frozen sediments in the far north of Russia proves humans were present in the Arctic some 45,000 years ago. This is 10,000 years earlier than previous evidence had indicated. The extinct animal's bones display distinctive cut marks that can only have been produced by stone and ivory-tipped hunting and butchery tools. 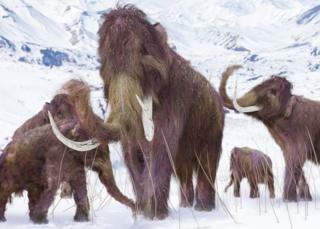 Being able to exploit mammoths would have been key to these early settlers' spread and survival in the Arctic. "Not all areas - and the location of the mammoth find is among them - provide good lithic raw material. This is very typical for most of northern West Siberia," explained Vladimir Pitulko, who is part of the team that reports the discovery in this week's Science magazine. He told the BBC that everything about the way these Arctic colonisers took down the mammoth demonstrates them to have been "very skilled and organised hunters and tool makers". The carcass was uncovered from a steep bank on the eastern shore of Siberia's remote Yenisei Bay, very close to the Sopochnaya Karga (SK) meteorological station. The latitude is 72 degrees North. By way of comparison, the previous firmly dated evidence for human occupation this far north comes from 35,000 years ago. The mammoth has various injuries to its head and ribs, but perhaps the most intriguing is the puncture mark in a cheek bone. Dr Pitulko and colleagues say it was produced by a sharp, robust implement, and from its geometry was very likely delivered when the animal was on the ground. They write in their Science paper: "This injury itself is probably the result of a missed blow, targeting the base of the trunk. "This specific hunting method is still practised in Africa by elephant hunters, who target the base of the trunk to cut major arteries and cause mortal bleeding. This blow becomes necessary after the animal has been sufficiently injured, and the SK mammoth displays numerous injuries in the thoracic (chest) area." The team discusses the mammoth find in the context of other archaeological discoveries from across the Siberian Arctic. The researchers build a picture of human settlers getting themselves close enough to the far northeast of Russia that they could have made an early bid to cross into North America before the last ice age became so severe that the way would have been blocked. This would have been prior to 30,000 years ago. "These finds change our mind on possible options and this is going to give a new stimulus for further research," he told BBC News. "These finds do not give an immediate answer, but allow thinking about the possibilities."